Andy Mossack drives his Grand Tour of Switzerland final leg as he takes us from Neuchatel back to his starting point at Zurich. 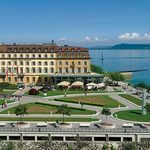 We bid a fond farewell to the Beau Rivage Hotel after a unforgettable lakeside dinner followed by a hearty breakfast we start our Grand Tour of Switzerland final leg. From here there is a Grand Tour of Switzerland route up to Basel which for the French or Germans could be a starting point. We on the other hand, are continuing our round trip south now around Lake Morat towards Fribourg, a quite magnificent medieval city. But before that, we delve into Roman history and make a short detour to Avenches. The spectacularly preserved amphitheatre is all dressed up to host an outdoor performance of Madame Butterfly, but we manage a sneak walk around it before driving on to Fribourg. This is a city which is authentically bilingual, both German and French is spoken and in no particular order. Very disorienting! We get disoriented further trying to get back on the Grand Tour route and end up driving around Fribourg’s upper and lower towns before joyfully rejoining the route towards Gruyeres, our cheese fest stop for lunch. 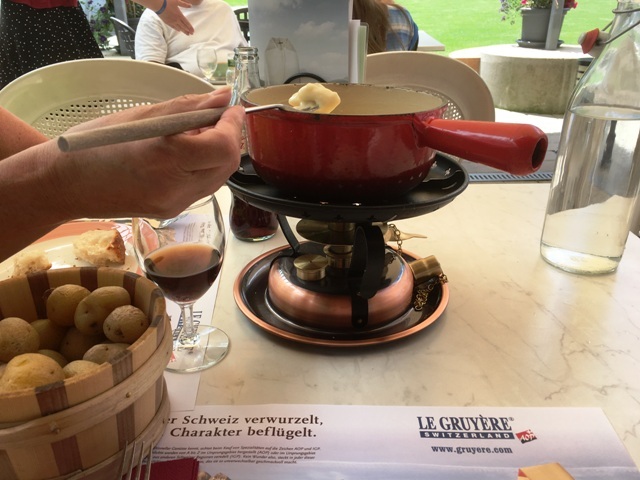 Pringy, just below Gruyeres’ old town and castle is where the cheese treasure is found; Maison du Gruyere is the modern production facility with an excellent tour and museum and a wide terrace where we feast on our long awaited fondue. There is a trek from here to the Moleson mountain dairy which makes Gruyeres in the traditional way if you fancy a long walk there and back, but for us it is back in our seats as we cross into the Bernese Oberland region towards Gstaad. Whilst Gstaad is a winter wonderland of celebrity, in summer the slopes are busier playing host to the cows making the milk for Saanenland Hobelkase mountain cheese, so hard it can only be shaved into slices by a special tool. Just 50 kilometres later from high up we spot the twin lakes of Thun and Brienz and Interlaken squeezed between them. We’re high up because we’ve stopped off at Mulenen and taken the funicular to the top of Niesen mountain. It takes 30 minutes to reach the summit of Niesen, a little quicker than the runners who chase up all 12,000 steps once a year on the world’s longest flight of steps. After coming back to earth, were on our way into Interlaken for our overnight stop at the magnificent Victoria-Jungfrau Grand Hotel & Spa. The Victoria-Jungfrau Grand Hotel is an imposing belle époque property, dominating the centre of Interlaken for over 150 years right opposite the main park, the popular landing spot for paragliders. 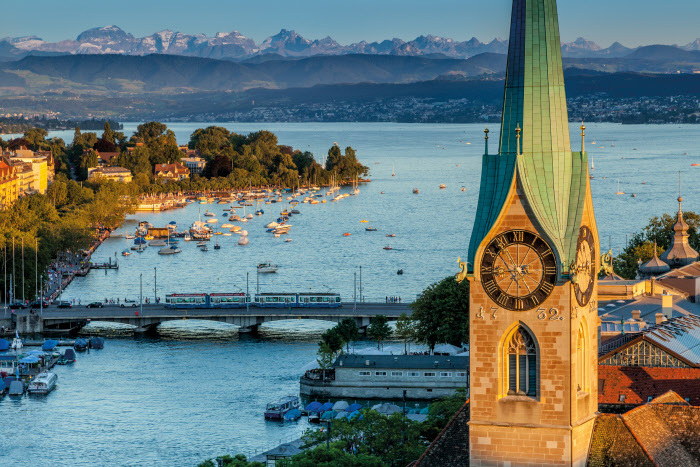 With the triple peaks of the Eiger, Mönch and Jungfrau always in view, Interlaken is a perfect base for exploring the region, principally because its mountain railway access makes it the gateway to the region’s lakes and mountains. We’re using this access today to explore the sensational Jungfraujoch, some 3,500 metres in the sky. A rail adventure on the famed Jungfrau line, first up to Kleine Scheidegg and then through the inside of The Eiger and The Monch before emerging out onto the glacier at the Top of Europe and the Sphinx Observatory. This is literally breathtaking not least because of the ratified air, it’s exciting and it’s magnificent and it’s a powerful reminder of how frail we are in comparison to Mother Nature. From up here we could take a walk out on the glacier but decide to take a careful walk through it instead in the blue ice tunnels of the Ice Palace. Our courage is rewarded with a free chocolate from the Jungfrau line on the way back down to Earth. Our penultimate leg is a lengthy ride of nearly 250 k but we’re allowing ourselves a two night luxury stay to recover from it at the splendid Park Hotel Weggis just outside Lucerne. 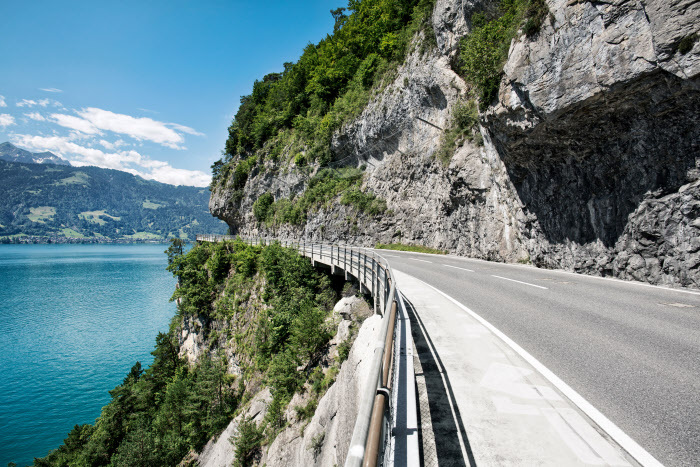 The Grand Tour route takes us all along the northern shore of Lake Thun and some stunning scenery before reaching the market town of Thun where we stop for a coffee in the old town by City Hall Square. 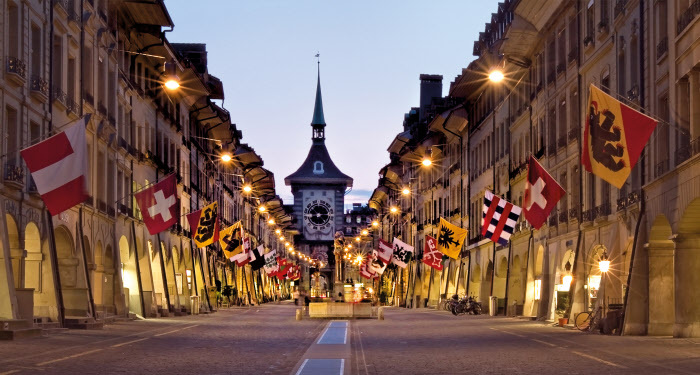 Switzerland’s capital Bern is next and I feel a little guilty for not giving it enough time. The medieval old town has UNESCO World Heritage status and more than enough sights to keep things interesting for a day or so. Indeed, you can kick off the Grand Tour from here, but we want to get to Emmental in time to see the cheese being made and find out just what makes those holes appear. Of course, there is no trade secret as it turns out, just the chemistry of fermentation and carbon dioxide! As we near Lucerne the Grand Tour takes us right past the front of Hallwyl Castle, built in the 13th century and completely surrounded by water. 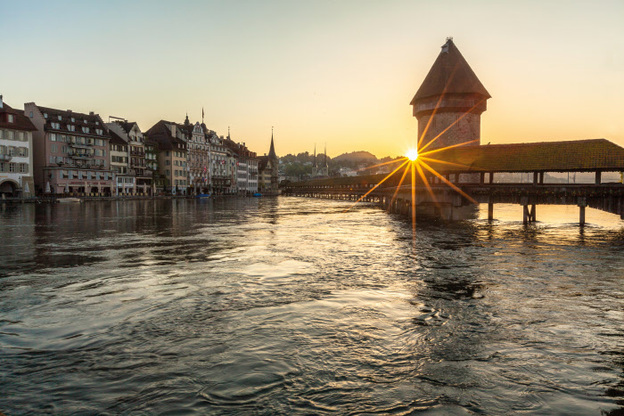 We roll into Lucerne and spot the wooden Chapel Bridge, one of Switzerland’s main landmarks on our way through. 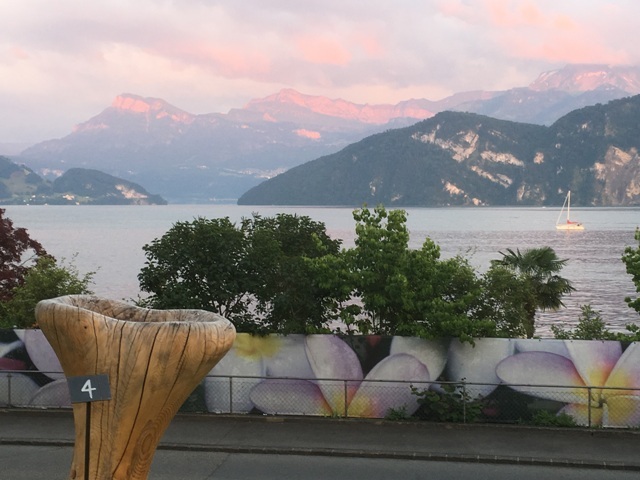 We will return to Lucerne and the bridge tomorrow but today we are heading for Weggis just a few kilometres outside of town and the simply wonderful lakeside luxury of the Park Weggis Hotel. Having to tear ourselves away from the Park Weggis Hotel was traumatic; the lure of our luxurious Adara suite, the Asian inspired private spa cottages, the infinity pool, and the private lakeside loungers was far too tempting. But we managed the impossible and walked the few minutes into Weggis and found ourselves in the middle of the Rosenfest celebrations. A festival of roses culminating in the choosing of the Rose Princess. From here we catch the ferry across the lake into Lucerne and explore the city. The covered wooden Chapel Bridge across the Reuss River is a must, unique for its 17th century internal paintings, now fully restored after a fire in 1993, we walk the city ramparts and stroll the bustling dockside promenade taking a particular interest in the artisan food stalls. The ferry delivers us back to Weggis with time enough to enjoy some live Rosenfest music before the desire to return to the Park Weggis Hotel proves too much to bear. Our grand Tour of Switzerland final leg back to our starting point at Zurich Airport is dominated by Lake Zurich where the last 30k is all along the lake shore. Before this however we’re on the trail of Switzerland’s legendary folk hero William Tell around Lake Lucerne taking the car on the small ferry across Lake Uri to Altdorf, the canton capital where there is much to tell about Tell. 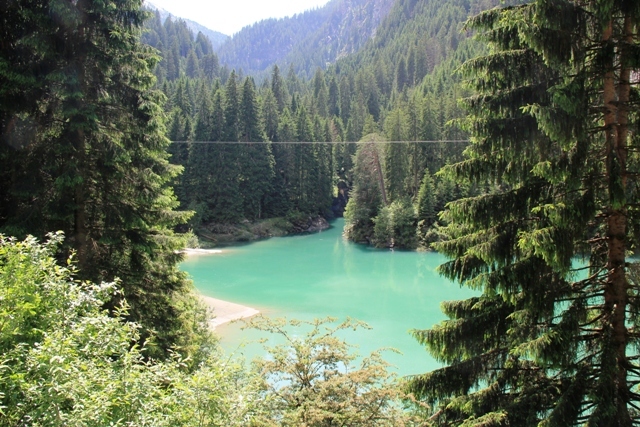 We drive through Schwyz and climb trough Rothenthurm’s wetland area before we catch our first glimpse of Lake Zurich. We cross the bridge at Rapperswil and have a final lunch in one of the numerous Italian restaurants overlooking the Lake and reflect on our Grand Tour adventure. Many jaw dropping moments, some unbelievable stretches of road, stunning countryside and such a variety of people and places. And of course, those magnificent Grand Hotels. Do I have a stand out moment? Perhaps the Rhone glacier, perhaps the vineyard terraces of Lavaux, then again there was The Tremola experience and then the beauty of Ascona’s Italian riviera. 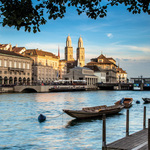 The Grand Tour of Switzerland offers such diverse experiences it is far too difficult to single out one from the other. The fact is, it is a genius travel adventure; a journey where the actual driving is just as important as the destinations you encounter. Taking myself away from motorways and just letting the Grand Tour immerse me through local life is simply a unique travel experience that will remain with me forever. For more information, detailed map and a bespoke guide book on the Grand Tour of Switzerland go to Swiss Tourism directly. 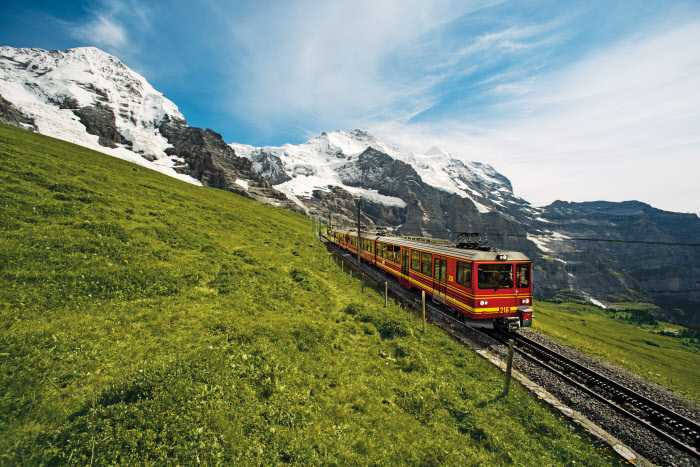 The Jungfrau Railways network connects the most breathtaking scenery in the region, and allows visitors to easily navigate the alpine meadows, glaciers, lakes and waterfalls that dominate the landscape. 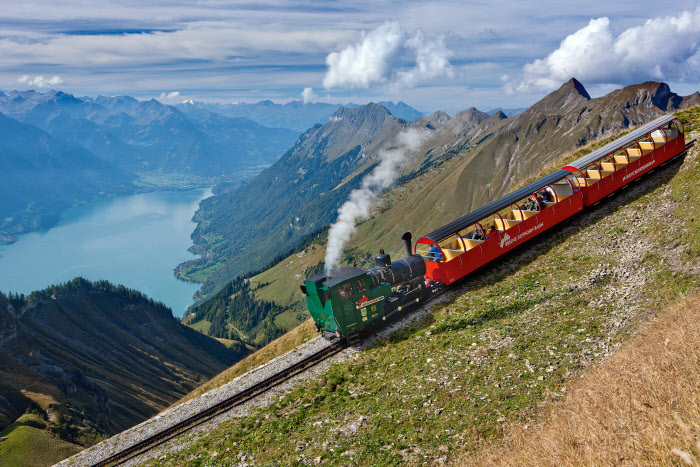 The Jungfrau Railway pass or VIP pass is an access all areas ticket to this UNESCO World Heritage adventure destination. The Jungfrau Travel Pass allows visitors to travel as often as they like for the duration that suits them – 3, 4, 5 or 6 consecutive days – on a variety of popular routes in the Jungfrau Region. 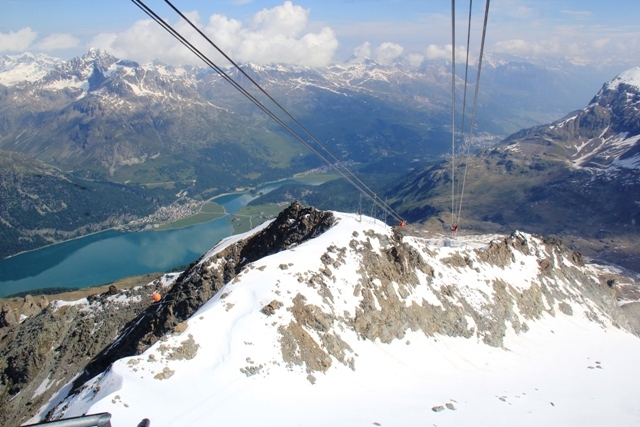 Why not check out the spectacular Eiger Glacier, or explore the beautiful heights of Schynige Platte, a well-known starting point for walking tours and the nostalgic cog railway? 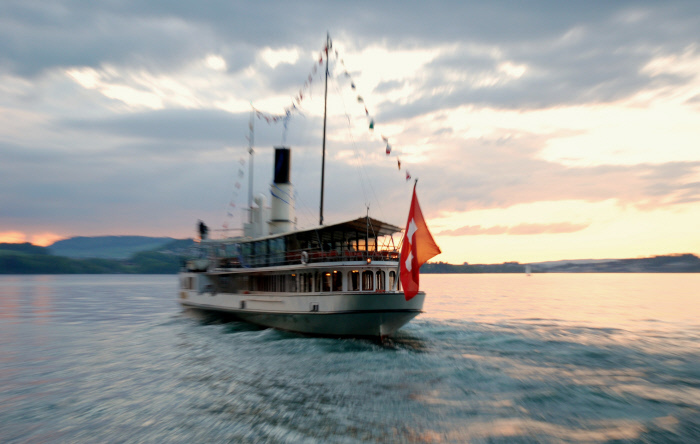 The pass for 5 and 6 days includes a boat trip on Lake Thun and Lake Brienz. All Jungfrau Travel pass holders also benefit from a 50% discount to visit Jungfraujoch – Top of Europe. 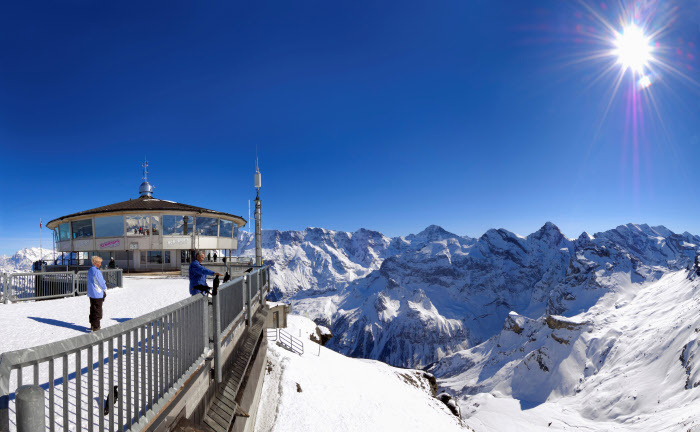 The Jungfrau Travel pass costs from 180CHF (£127) per adult for a 3-day 2nd class pass (This is cheaper than a return on its own to the Jungfraujoch at 204.40 CHF.